This is my morning breakfast. 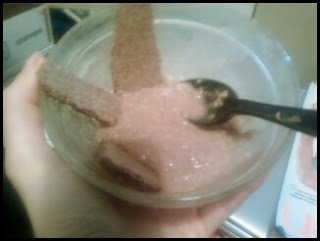 I had 3 bowls of this, 4 bran crackers ( this is 1/2 of one split into 4ths) with the instant cereal microwaved. This is 1/2 the serving. This is another tiny bowl of it, this time made with DaVinci Gourmet SF coconut syrup, bran crackers and some sugar free pancake syrup stirred in. Off to go make a cucumber salad, sui choy, and veggie platter. My workout this morning was alright. Not a ton of energy, but I was in that meditative 'zoned out' mind set. It went by fast and it was a blur the entire time. Felt like my brain wasn't turned on. Did 55min on the elliptical. Below is part of my cucumber salad. 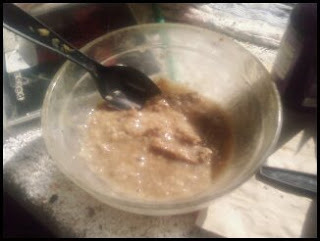 Cuc's, cystal light, cinnamon, sweetner, lemon juice and a scoop of PGX fiber with sf jello! Monster bowl with 2 packs of fermented Sui Choy, 1 can of yellow wax beans, 1 can of bamboo shoots, cucumbers with honey mustard. I ate this with 7 big sheets of Nori Seaweed as wrappers. I then went to see the movie UP again, ate about 30 mr.freezie sugar free popsicles, and then came home amidst a freak down-pour and made dinner. Had Chinese Cabbage instead of my romaine, with shiritaki noodles, bamboo, cucumbers, red pepper, green onion, tomato, yellow canned beans, tuna and my seaweed wrappers.